Hubert von Goisern and the Austrian Folk Song Society: Come, let's sing! With his passion for and commitment to keeping Austria's rich history of folk music and songs alive and accessible for contemporary audiences, Hubert von Goisern is the perfect fit for the new campaign from the Austrian Folk Song Society, "Come, let's sing". The society, which is based in Vienna and has branches in the Austrian provinces, collects, documents and shares regional musical culture past and present. Workshops, exhibitions and concerts, as well as projects in collaboration with schools across the country are all part of what the organisation, which was founded in 1904, has to offer. This year's focus for the long-standing school project "With Every Sense" bears the title "Come, let's sing", which invites schools to develop an Austria-wide repertoire of songs, designed to encourage singing together. Hubert von Goisern sees "primarily a kind of education of the heart" in singing together, as he explained at a press conference on Thursday. Singing together creates trust and ensures "that nobody is left behind, who might not be able to do it quite so well," said von Goisern. More so than any instrument, the singing voice "really comes from the centre: even I, although I am often on stage, have to overcome my own inhibitions a little each time. It's a kind of fear. So you learn to trust your listeners and those playing with you." And perhaps even more importantly: you learn to listen. "Engaging and feeling the harmony or tension with the others - there's no better place to practise that than in singing with others." However, to be able to do that, at school, with family or friends, you need a joint repertoire. "Singing brings people together", Hubert von Goisern further explains. "On my travels I have met all kinds of different people. Singing and playing music together has often produced a common inner connection. People tune into each other, they have to open up! We Austrians also belong to a culture that has a long history of singing. I grew up with the songs and music of my close surroundings. I find it really exciting to push into the heart of tradition. In this highly technologised, global world, people long for something familiar to create this inner balance. But nowadays people barely know any shared songs. I see my mission in this campaign as supporting young people in finding the songs they share." The aim of the project is to find, learn and establish a collective repertoire of songs among the students in order to encourage singing together beyond school, in families and communities. Singing should be experienced as something to benefit one's mental and physical wellbeing, as well as being a form of communication and a companion through life. Hoch auf dem gelben Wagen, Das Heideröslein or Wahre Freundschaft soll nicht wanken. There's barely anyone who went to school in the 1960s who didn't have the little red book Komm sing mit in their school bag. It was first published in 1962 and over the years worked its way into the collective memory of Austrian men and women. According to alpine rocker Hubert von Goisern singing is part of emotional development, contagious and confidence-inspiring. As the figurehead of the Austrian Folk Song Society's new initiative "Komm, wir singen!" 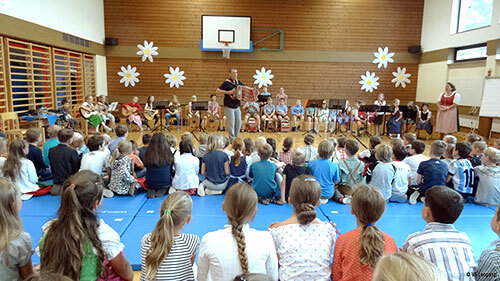 he has put himself at the service of this project and is visiting Austrian schools in search of songs. It's clear that in the 21st century this won't end up looking like it did at the beginning of the sixties. So English language songs will be welcome, along with pop songs - and of course folk songs as they have been passed down and sung for generations, whether in among families or in mountain huts. Interest in his son's music lessons led the musician to the teacher, who excused the lack of singing on offer with "they don't want to sing". Hubert von Goisern took up the challenge and taught for a year the way he wished. The singing project "Come, let's sing!" got off to a brilliant start in the 2017-18 school year. Schools from across Austria came up with a total of 400 suggestions for songs that are popular for singing, have been known in Austria for many years, are suitable for a creative and intercultural approach in a school environment, or which the children have learned from their families or local communities. Since the project launched, 2040 pupils, 190 teachers and 60 advisors and ensembles have put together school projects with the aim of finding songs. 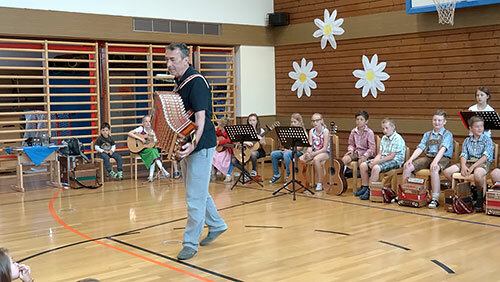 Many more schools responded to the call to suggest songs for a collective repertoire, without taking up the financial support on offer from the provincial branches of the Austrian Folk Song Society. Now the project's patron and "booster rocket", Hubert von Goisern, has compiled his personal selection of songs from these suggestions, with creating the impetus for singing together in mind. Only the "larch yodel", Lära Brett, was his personal request, he said. Not everything that was requested multiple times made it to the list: including The Lion Sleeps Tonight was unfortunately not possible due to rights issues, Goisern also deliberately omitted his own Weit, weit weg and Brenna tuats guat: "It would have been too personal for me", said the musician, who suggested that his choices would have been different in a project of his own. More difficult melodies and more critical lyrics would have likely been included. Singing teaches you to raise your voice, to listen, to develop a sense of community and empathy, as Hubert von Goisern confirms: "Had my teacher not offered me music as a developmental space, I'd have failed miserably at school. My life began with singing." In the coming two school year 2018-2020 all Austrian school grades and establishments are invited to study these songs as part of music, dance, rhythm or musical theatre. The songs are free to be interpreted in many different ways, as well as developed in different languages, creative and cultural history. In singing these songs is intended to establish relationships with other cultures and forms of art and cultures, new media and extracurricular institutions, as well as creating encounters between generations and to people with special needs. At the end of the 2019/20 school year, the songs will be performed in a concert together with Hubert von Goisern.